INTEL UHD 620 GRAPHICS ~BLUETOOTH ~HDMI ~WIFI ~NEW BOX! Processor: Intel Core i5 8th Gen.
WOW 7200+ SOLD! RED, SILVER, PURPLE, BLACK ~ BLUETOOTH! Lenovo IdeaPad 320 Laptop, 15.6" HD Display, AMD A12, 8GB RAM, 1TB HDD. Lenovo 320-15ABR Laptop: Organize and simplify your life with this Lenovo Ideapad laptop. This Lenovo Ideapad laptop is equipped with high definition resolution for powerful screen clarity. Lenovo ThinkPad W510 15.6" HD 2GHz i7 X920 500GB 8GB Windows 7 Ultimate NVIDIA Q. Condition is Used. 500GB 5400RPM Hard Drive. RADEON R7 GRAPHICS ~ BLUETOOTH ~HDMI ~WIFI ~SEALED BOX! Quad Core AMD A12-9720P (2.70 GHz - 3.60 GHz). AMD Radeon R7. 8GB DDR4 SDRAM. 15.6" HD Energy-efficient LED backlight Display (1366 x 768). 2 x USB 3.1 | 1 x USB-C | 1 x HDMI | LAN. GENUINE Windows 10 32bit with Restore Partition!! 500GB Hard Drive. Lenovo IdeaPad 130 15 15.6" Laptop Computer - Black. 4GB DDR4-1866 RAM. DVD-RW Drive. 1TB hard drive for ample file storage space. Lenovo 330-15IKB 81DE. HDMI output expands your viewing options. 2-cell lithium-ion battery. Number of HDMI Outputs (Total). Connect to an HDTV or high-def monitor to set up two screens side by side or just see more of the big picture. Trending at $399.99eBay determines this price through a machine learned model of the product's sale prices within the last 90 days. (Lenovo ThinkPad T540 p - Core i7 Quad Core. MAX Turbo, 6MB L3, 1600MHz FSB). Battery Genuine Lenovo Battery Capacity 6 - Cell (44 WHr). The machine feels tight and solid and Very High Quality! SD Card Reader. 1920 x 1080 ( Full HD ). Regular (Not Backlit) Keyboard. WiFi Module Built-in. Bluetooth Module Built-in. Lenovo IdeaPad Y510p 15.6in -6G RAM Condition is Used. -The headphone jack does not recognize when headphones are plugged in - bluetooth headphones suggested for gaming. --This Laptop has been updated to run Windows 10--. Hybrid 1TB 5400 RPM 8GB SSHD. MODEL: W530. Hard Drive: 500GB HDD. OTHER: No AC adapter included. Units have minor scratches as pictured. Very gently used in Mint condition. Screen Size: 15.6" HD LED. We hope our service will exceed your expectations! Part Number: 320-15IAP. Lenovo Yoga 730 2-in-1 15.6" i5-8250U 8GB RAM 256GB SSD Laptop Touchscreen. Shipped with USPS Priority Mail. Lenovo ThinkPad W541 Laptop. W541 20EGS0AE00. 512GB Solid State Hard Drive. Microsoft Windows 10 Professional 64bit. Units are in excellent working condition with minor wear. Display Size. Trending at $599.00eBay determines this price through a machine learned model of the product's sale prices within the last 90 days. Processor: Intel Core i7 4th Gen. Processor: Intel Core i5 5th Gen.
8GB DDR4 RAM | 256GB PCIe SSD. Touchscreen Yes. Viewing Angle Not Specified by Manufacturer. Audio 1 x 1/8" (3.5 mm) Headphone/Microphone Combo Jack. Finish Matte. Watt Hours / Type 52.5 Wh. Webcam User-Facing: 720p Video. Here we have a Lenovo Thinkpad T530 15" screen MODEL 2394-2c2. SCREEN IS a PERFACT FULL HD 1920X1080 (RARE option for this model) and GREAT With NVIDIA NVS 5400M Graphics! Nice color and brightness. Video 2GB NVIDIA GeForce MX130 Graphics. Warranty This computer is covered by Lenovo Manufacture warranty till November 2019. Warranty is through the manufacture (Dell or Lenovo) directly. Audio Wave Systems Software. This Lenovo IdeaPad laptop has 1366 x 768 resolution that produces a crisp, colorful display. 4GB RAM / 500GB Hard Drive. 500GB hard drive for serviceable file storage space. New Lenovo 15.6" Laptop - Platinum Gray. We're power testing, bios for ram and making sure that windows 7 pro is in setup mode. Also many of these were downgraded from Windows 8 Pro to Windows 7 Pro but I believe you can create recovery disk once the OS has been installed. Type: Notebook/LaptopBrand: LenovoProcessor: Intel Core i7 8th Gen.
1TB HDD SATA 5400rpm. 4GB DDR4 SDRAM. 15.6" HD LED Backlit Anti-Glare Display (1366 x 768). HD Webcam with speakers. Lenovo Y700 15.6" Core i7-6700HQ 2.6GHz, 16GB RAM, 1TB HDD Plus 256GB. Condition is used. This laptop has been refurbished by a team of highly trained professional technicians. We guarantee their work with a 90 day warranty. The laptop is thoroughly tested to make sure it is working right out of the box. They come installed with a fresh copy of Windows so that you will be able to customize it as you want. These units are off-lease laptops from businesses. This ensures that the cosmetic quality of our laptops are very good. For more information, check out our video on the cosmetic grading process we implement at Frankie's Fast Ship..
Lenovo ThinkPad T520. HDD 320 GB. CPU:i7-2620M @ 2.70 GHz. Windows Updates. Microsoft Security Updates. Device Manager. Bluetooth Connectivity. Functioning Webcam. ThinkPad T550. SSD (Solid State Drive). Software/Data Recovery is not covered under Warranty. Hard Drive. It's made to last and it's truly the largest difference between the stuff you "can get" and the stuff you must have to change the way you compute. Brand: LenovoProcessor: Intel Core i5 5th Gen.
FHD 1080P High Quality LCD TN, Looks great! Lenovo ThinkPad. Not Applicable, 64GB SSD. 32GB (4x8GB). 170W Lenovo OEM Power Adapter. Windows 10 Professional. Spindle Speed. Watt Hours/Type 94Whr (9 Cell Extended). 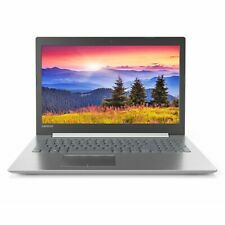 Lenovo IdeaPad 130-15AST Laptop, 15.6" HD Display, AMD A9, 4GB RAM, 128GB SSD, Radeon R5. Lenovo 130-15AST Laptop: Improve productivity with this Lenovo Ideapad laptop. 128GB solid state drive (SSD). ThinkPad T510, 15.6", i5 M520, 4GB RAM, 500GB HDD, Windows 7 Pro 64bit, Fingerprint reader, camera. Ship with AC Adapter/Charger. Condition is Used in very good condition. Shipped with USPS Priority Mail. SSDs also receive less wear and tear than traditional hard drives, as they don't have any read and write heads. There are also four 5 Gb/s USB 3.0 Type-A ports, one of which doubles as a charging port. This is a USED laptop. As such, it shows signs of moderate use. There are a few minor scratches/dings/scuffs on the corners/sides, and normal wear and tear. These signs of wear do not in any way affect the excellent working condition of this laptop. Lenovo ThinkPad T540P laptop - BIOS updated to the latest version. Webcam with microphone so you can Skype with friends. This laptop is FAST, working perfectly and is in very good condition with a few scratches from normal wear. Brand: LenovoProcessor: Intel Core i7 4th Gen.
128GB Solid State Drive. DVD-RW Drive. Product Info. Trending at $349.99eBay determines this price through a machine learned model of the product's sale prices within the last 90 days.